I am an Indianapolis transplant. Though I attended college in Indiana, my first big city was Chicago. The only problem is that Chicago has a tendency to eat up young millennials like myself. High taxes and even higher rent drove me to the center of the Hoosier state and all of its fiscal benefits. But, like any decision such as this, there’s a sacrifice to be made. In my case, that sacrifice was Chicago-style pizza. All other pizza is inferior. I’ve been ruined for all other pizzerias. Flowery language and romantic sentiment aside, Jockamo pizza really is excellent. In fact, pretty much everything there is excellent. Let’s focus on the salads and the appetizers first, because eating there without getting salad or breadsticks is a travesty. My personal favorite starter is the spinach salad topped with egg, tomatoes, mushrooms, bacon, and a warm sweet and spicy dressing. Apart from being very tasty, this salad offers a nice contrast between the crunchy bacon and the soft egg. The warm dressing is also a differentiator because it ties the entire thing together. You can tell that a lot of thought has gone into the menu even down to the salads. 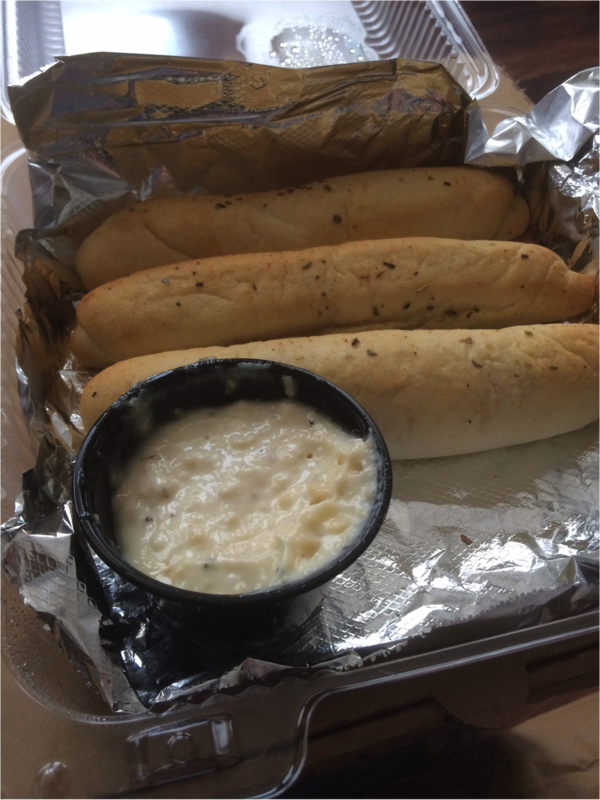 Then there’s the breadsticks. Warm, chewy, spiced, salty, delicious breadsticks. I’d describe them in more detail, but I honestly think they’re something you need to go and experience for yourself. When you go, get the creamy parmesan cheese dip. And when they take your completely empty basket of breadsticks away, keep the dip for your pizza. That stuff is straight up dangerous. While the above is nice you don’t buy concert tickets for the warm up bands (unless you’re a hipster). Luckily, the main event is just as good live as it is on the album. Pepperoni, ham, sausage, bacon & sliced steak. A personal favorite of mine, the Slaughterhouse Five is perfect for carnivores. Whereas other pizza joints might nominally include different types of beast on their pizzas, Jockamo loads up every slice with heaps of delicious meat. +1 for the Indy-centric Vonnegut reference. Pesto sauce, artichoke, tomato, 3-cheese blend, balsamic reduction. Why bother with a boring cheese pizza when you can choose from the carefully crafted vegetarian options? 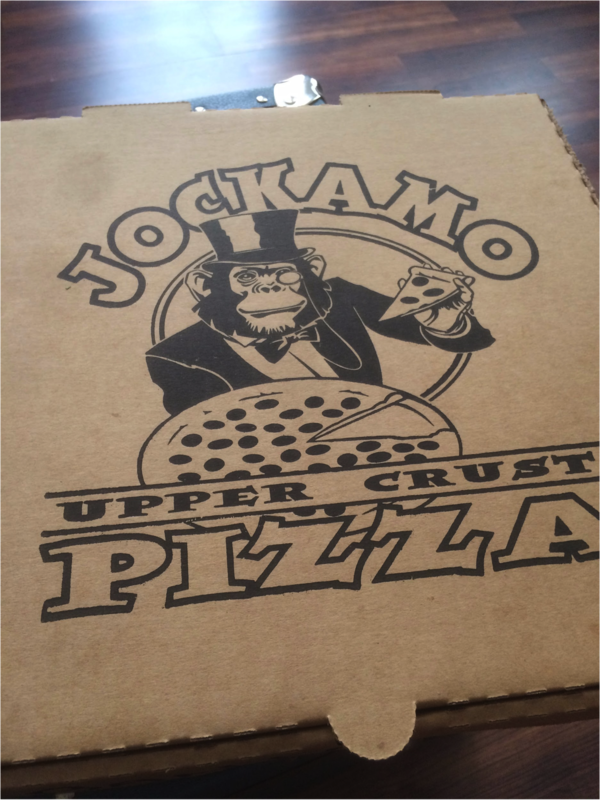 Their Margherita pizza is delicious, but I like the flair and intense flavors of the Jockamo Special. The artichoke really shines on this pie and is perfectly complemented by the balsamic vinegar. Gourmet indeed. This category could have been satisfied by a number of choices (Such as the The Cuban, The Creole, or the weekend-only Hangover Pizzas) but I picked the Bollywood for sheer cheekiness. This is by far the most exotic pizza I’ve ever eaten. The toasted coconut in particular is a playful flavor that dances atop the accompanying intense ingredients. In essence, Jockamo serves food that is both interesting and tastes good. The novelty of their creations is not shallow (so I guess that qualifies as “deep dish”). When I go, I’m always trying something different because the variety of options is just that good. As I settle into Indianapolis, I can take comfort in knowing I’ve found that elusive pizza joint to steal my heart.